When editor John Joseph Adams approached me for a fictional Kickstarter for this anthology, I immediately thought of time travel. Because a Kickstarter is a process, not just a static web page, it could show the effect of time travel over the course of the story. Writing that idea… turned out to be a bit of a challenge. Still, I think it turned out well. One challenge I did not anticipate is the length of the title. 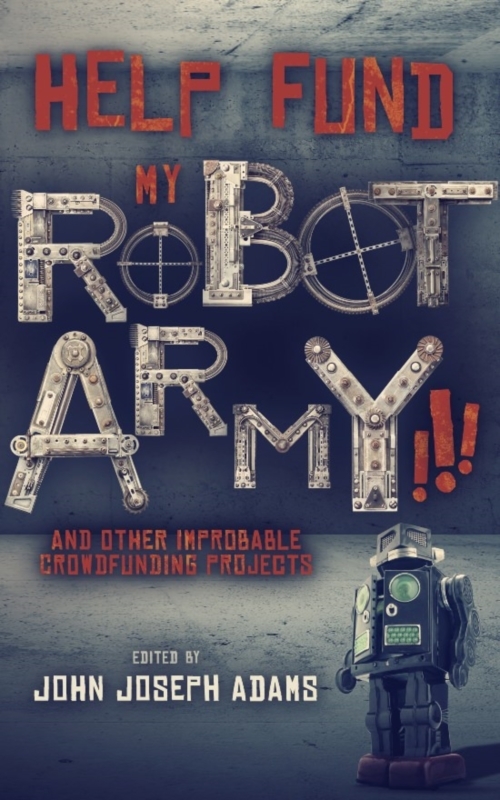 The full title of this story is “A Practical Mechanism for Overcoming the Directionality of Temporal Flow” and the title of the anthology is HELP FUND MY ROBOT ARMY!!! and Other Improbable Crowdfunding Projects. Together they are too long to tweet! The forward flow of time is simultaneously one of the most basic and one of the least understood forces in physics. Everyone understands that time marches on, at an inexorable rate of one second per second, but the fact is that the equations work just as well if it goes in the other direction from the one we’re used to. Why? Nobody knows. But in my graduate work at Simon Keele I stumbled onto an interesting interaction between a couple of subatomic forces that could reverse this flow, or even disconnect an object from it completely. My initial experimentations with the available hardware were promising, but with the additional $17,000 we’re looking to raise, we could purchase the necessary equipment that would allow me to develop it into a practical mechanism.